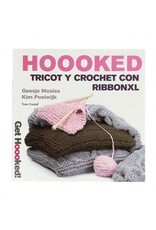 HK Book Spanish Tricot y Crochet con Ribbon XL - Crochet Stores Inc. In the fourth book you will find crochet and knitting examples all made from RibbonXL. You will find new patterns for pillows, poufs, bags and even clothing: scarves and tops.